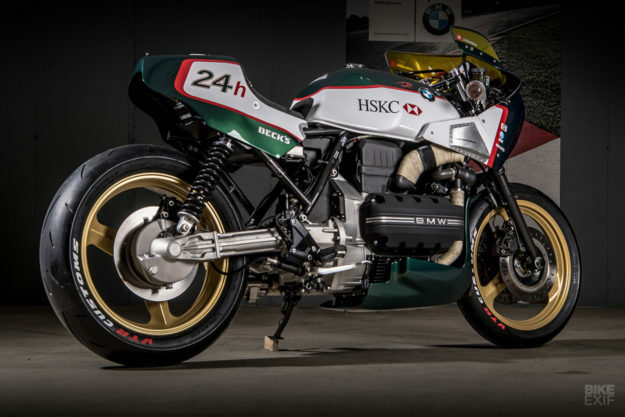 If there was ever a golden age of motorcycle racing, we’d pin it on the late 70s and early 80s. Those were the days of the endurance racers, when hairy-chested pilots wrangled big four-strokes around the track for hours on end. 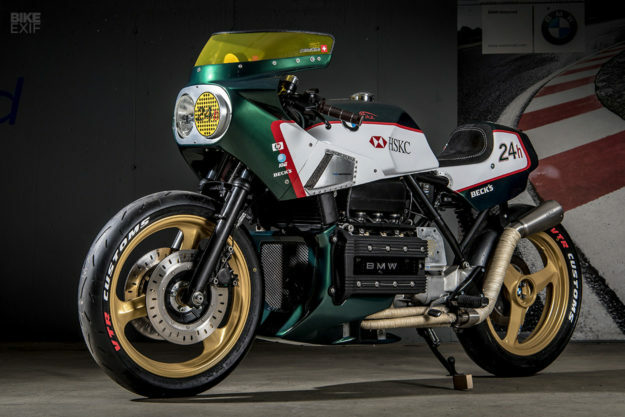 Honda, Kawasaki and Suzuki battled Italian exotica from Laverda, Ducati and Moto Guzzi, with the added danger of pit stops for extra fuel and fresh rubber. We’re unlikely to see a return to these exciting times—but there’s a resurgence of interest in the era, and it’s seeping through into the custom scene. 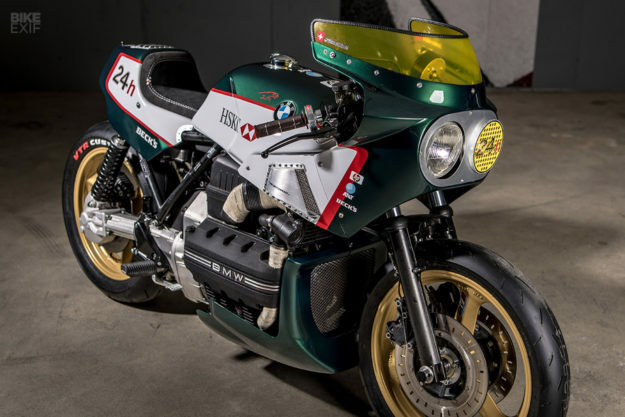 VTR caused ripples a few months ago with a K100 built in collaboration with the shipwrights Boesch Boats, but they’ve outdone themselves was this endurance-style street legal racer. The VTR crew are all 80s motorcycle kids, starting their on- and off-road racing careers in the neon decade. So they know how to tap into that vibe. 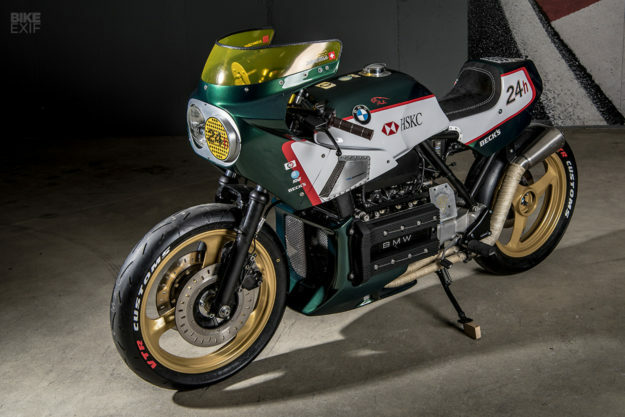 In the VTR storeroom, they found an 80s fairing from a GSX-R750; then they located a tail unit in their cellar—along with a PVM three-spoke wheel set suitable for the K100. “Beside these key elements, we already had a picture of the design in our heads,” says Dani. 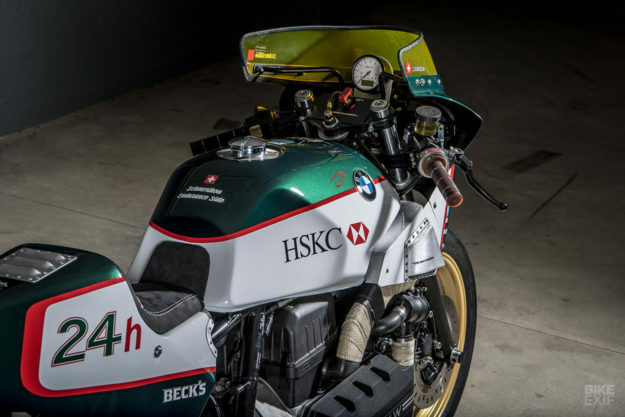 “We’d have double headlights—with an alloy race cover fitted over one of them, for the ‘one-eyed’ look.” The cover is removable, to meet Swiss transport regulations. The looks of the ‘flying brick’ engine are an acquired taste. 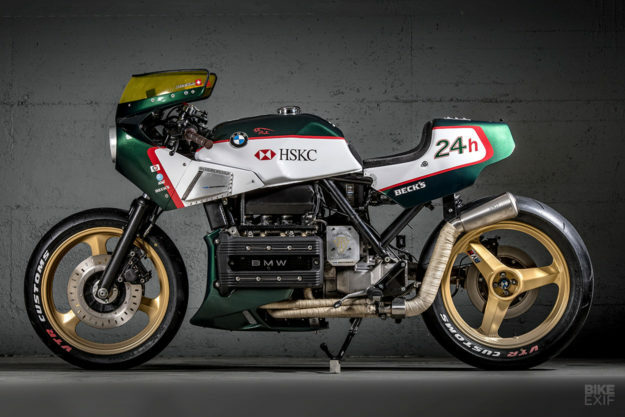 But they’re a key part of the 80s vibe, and Dani wanted to avoid people thinking, “Oh, another Japanese retro bike.” So VTR kept just the upper part of the Suzuki fairing, and added a pair of vented side panels to match the downward lines of the tank. 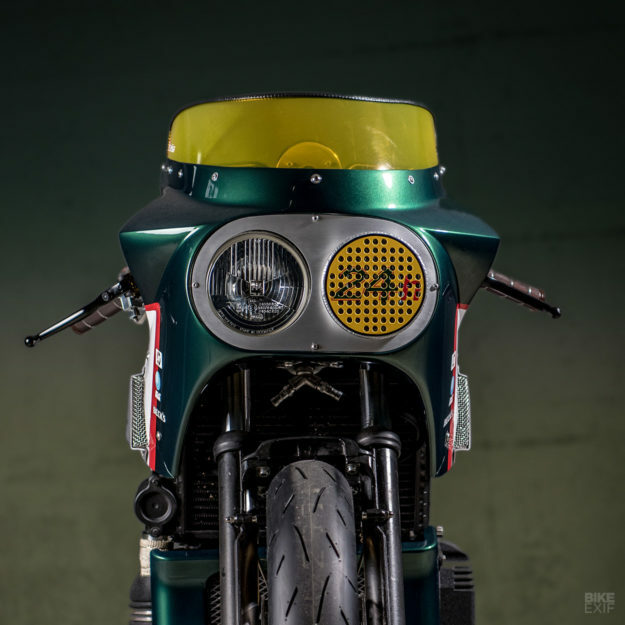 The tail unit houses the smallest street legal taillight on the market, made by Kellermann. “We wanted hide it in the tail section at first, but then decided to put it on top to follow the endurance racer style.” Upholster Yves Knobel added a perforated Alcantara seat pad in dark grey. The windshield on the GSX-R750 fairing was a little too overbearing, so VTR trimmed it down to a lower profile, which was also seen on some bikes of the 80s. VTR’s own repro Monza gas cap and a Motogadget Motoscope Classic tachometer add a touch of authentic race style—and keep everything street legal. The clipon bars are ABM Varios, the brake master cylinder and throttle are from Magura, and there’s an engine start switch in the cockpit. With 90 stout German horses on tap, the longitudinal DOHC inline four has plenty of grunt. 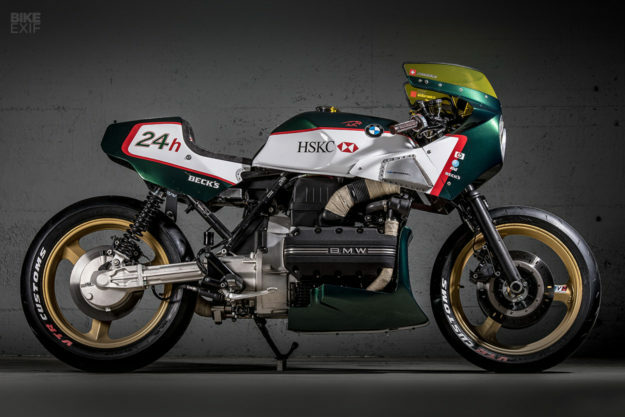 It now breathes through a steel exhaust from Italy’s Unit Garage, with a titanium muffler and removable dB killer. Together with their regular painter Freuler, VTR analyzed the Jaguar style. “To be as authentic as possible, we looked at the Jaguar sponsors from that time too,” says Dani. 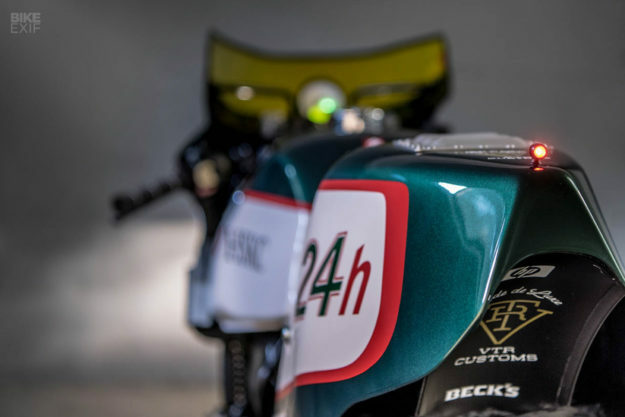 “The only change we made was to turn the HSBC bank logo into ‘HSKC’—to reference Schmerikon, our hometown.” The ‘24h’ on the number plates is in the style of the original Le Mans Logo, and the green is the perfect match for the light gold powder coat on the wheels. 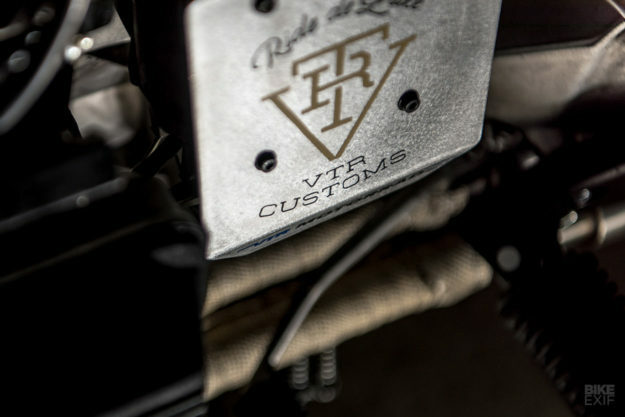 VTR only build one-offs; they don’t reproduce their bikes, and they don’t sell parts or kits either. So ‘24 Hours’ is a one-of-a-kind. 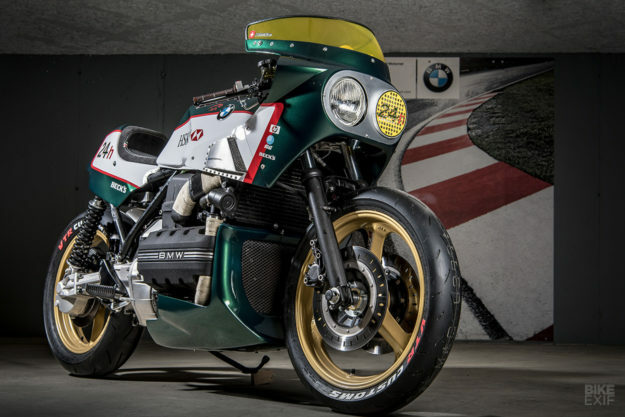 The good news is that it’s for sale at 26,500 Swiss Francs (US$27,000), and it’s road legal too. If you fancy adding a dash of the resurgent 80s style to your garage collection, give Dani and co. a call.